"Your password can't contain spaces." is a message I see from some websites, including 1 . Why? (This question is very similar to Why Disallow Special Characters In a Password? , but the answers there don't seem to apply to the space character). Why not simply hash whatever the user typed in, spaces and all? I can't explain it as anything beyond legacy madness, or lazily copying username restrictions to password restrictions without forethought. Any block of data, printable or otherwise, should be acceptable if you're hashing your passwords. The only restrictions should be a minimum complexity and a "sanity" maximum length so somebody doesn't soak up 1MB of bandwidth (and the corresponding CPU time to hash the input because you use a slow algorithm, right?) every time they login. Leading and trailing spaces could be trouble for people who are loose with copy and paste. Otherwise, agreed with the other posts, no good reason. Although, what other characters are we blocking? tab, cr, lf, backspace, beep ☻☺♪▬♣. ? The simple answer is that it is a bad password policy. 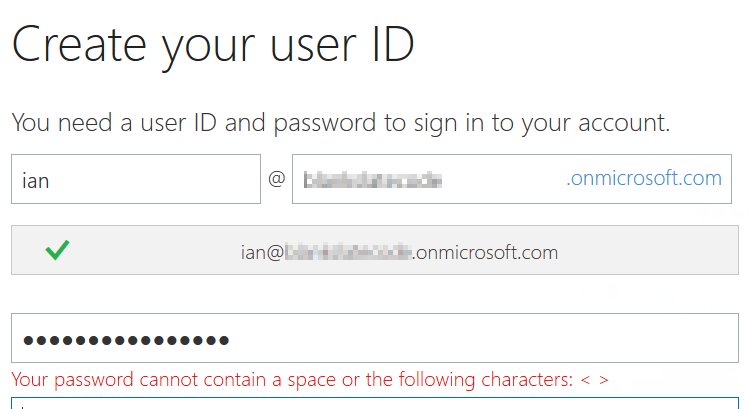 I can think of no particularly good reason for forbidding the space character. This is probably just some arbitrary requirement set by a well-meaning but wrong person. I can't think of any solid security reason other than it discourages people from using actual sentences as passwords which would be very insecure if they had actual meaning. Strictly speaking, there is nothing insecure about a space in a password if it maintains good entropy, so people being "creative" is the only real thing that I can see. It’s a very good policy for convenience, and having seen this from the customer support side – I think this should be implemented everywhere. You can write the password like this: “ abc def ghi ” and copy it to a piece of paper, or copy and paste. its only about programmatic semantics. most everything handles the space character ' ' or " " different from other symbols like 'a' or 'dds'. In some computer environments where we were passing files back and forth from MAc to Windows to Linux, we sometimes ended up with (' ' == ' ') to produce a FALSE result (the double equals sign simply signifies a comparison operator). It was false because there were hidden symbols existing in the space that we couldn't see due to computer cultures being different across our team. On most keyboards, the Space key makes a sound that's slightly different from that of any other key. Consider the scenario in which a person hears someone else type in their password. If that person is able to figure out that the password consists of, for example, 3 characters + a space + 4 characters, that could be a very useful hint in some cases. If you transmit a password that have spaces in it, how does the recipient knows that it's a space or a tab? And is it one or two spaces? Assuming you have to hand-write it (it happens), how to show this information? Depending on the font of their email client, there's also a chance, they won't notice the blank space(s). Again, when sending the password, if the spaces are at the beginning or end, it will be easily missed and will have to be enclosed in quotes. But even then it will look odd and I can easily imagine users not including this last space and being unable to login. Blank characters (newlines, tabs, spaces) are often trimmed from the end and beginning of a field, to avoid people copying and pasting incorrect data. Obviously if the spaces were significant, that would cause a problem. All in all, I think not having spaces avoid all kind of problems and saved support calls, so it is a good thing. Let's say important business documents are locked on Bob's station, who is currently on vacation. What to do in this case? Wait for Bob to return two weeks later and lose potential business in the meantime? Or just ask him to send the password? It's Bad for sure but still better than the alternative. As Linus Torvald put it (about something else, but I like the spirit): "you should deal with reality, not what you wish reality was". I am going to qualify this comment by saying I have been a sysadmin for over thirty years... and a writer for at least as long. Although using a space in a password may be allowed in some circles, and it may be more secure in the sense that you have a greater character set to harden your password with... you are asking for trouble by doing so. A space is not just a character, is it a representation of null space, just like a zero represents an absence of numerical value. The day will eventually come where you will “forget” the space and will pull your hair out wondering why your root password doesn’t work anymore and have to reload your server from scratch. From a useablility standpoint - I say keep away from the space... it’s one of those “unwritten rules” that you can give a hundred reasons not to obey but your life will be made easier by adhering to. In thirty years I only encountered one person who used a space in a password and it was hell trying to figure out. Others will disagree - and that’s their prerogative. I would never use a space. Is there any risk in allowing more failed login attempts before autobanning for a longer time? Should a space in a password count as a symbol when checking for complexity? What's the most effective type of password?